Kerry adventurer and polar explorer, Mike O’Shea, has become the first person to fly from Mizen Head to Malin Head by a paramotor, navigating his journey and monitoring his health through hazardous conditions using mobile technology.Traveling at heights of up to 10,000 feet with temperatures reaching below zero, the adventurer completed the 590km journey over three days. His flight was supported by Vodafone Ireland to mark the launch of the Vodafone Firsts programme here, a global initiative that encourages people to do something remarkable for the first time – with mobile technology at the core of their adventure. A video of Mike’s journey can be viewed below. The adventurer’s route took him past some of Ireland’s iconic landmarks including picturesque Inch Beach, the dizzy heights of the Cliffs of Moher and Benhulben Mountain. The changing weather conditions and strong gusty winds that threatened to scupper the flight were monitored closely by his support team using mobile phones and tablets. GPS tracking enabled ground-to-air tracking of O’Shea during the flight when clouds obscured visibility, with the team able to check in regularly with him and the helicopter that shadowed the entire flight via high definition mobile calls which picked up even the faintest transmissions. O’Shea also wore a smart watch which enabled the team to monitor vital signs including the strength of his heartbeat at all times. Mike O’Shea said: “I’m always on the lookout for new challenges and the chance to take on a new adventure. 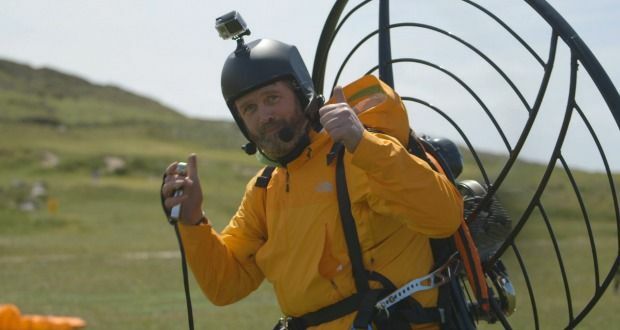 Becoming the first person to paramotor from Mizen to Malin has been a personal ambition since I first took up this sport and I’ve been able to achieve it thanks to Vodafone’s support and technological expertise.